Ownership. All information, documents, materials, graphics, photography designs, logos, layouts and computer codes (collectively, “Content”) of this Site is (and shall continue to be) owned exclusively by NUKEM Isotopes GmbH, and is protected under applicable copyrights, patents, trade-marks, trade dress and/or other proprietary intellectual property rights. The copying, redistribution, use or publication by you of any such content or any part of this Site is prohibited, except where specifically provided in the license above. Under no circumstances will you acquire any ownership rights or other interest in any Content by or through your use of this Site. The information on this Site is provided solely for users’ general knowledge and is provided “as is”. NUKEM Isotopes GmbH makes every effort to ensure that the information and data contained on its website is correct. This Site may contain bugs, errors or other problems. NUKEM Isotopes GmbH makes no warranties, expressed or implied, and NUKEM Isotopes GmbH disclaims and negates all other warranties, including without limitation, implied warranties or conditions of merchantability, fitness for a particular purpose or non-infringement of intellectual property or other violation of rights. Further, NUKEM Isotopes GmbH does not warrant or make any representations concerning the accuracy, likely results or reliability of the use of the materials on this Site or otherwise relating to such materials or on any websites linked to this Site. The materials appearing on this Site could include technical, typographical or photographic errors. NUKEM Isotopes GmbH does not warrant that any of the materials on this Site are accurate, complete or current. NUKEM reserves the right in its sole discretion to edit or delete any documents, information or other content appearing on this Site without notice. 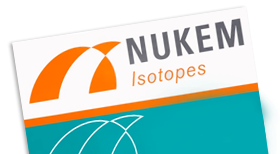 NUKEM Isotopes GmbH has not reviewed all of the websites linked to or from its Site and is not responsible for the contents of any such linked website. The inclusion of any link does not imply endorsement by NUKEM Isotopes GmbH of the linked website. Use of any such linked website is at the user’s own risk. To the maximum extent permitted by law, NUKEM Isotopes GmbH shall not be liable for any direct, indirect, special, incidental or consequential damages arising out of the use of – or the inability to use – this Site or its Content, whether based on breach of contract, breach of warranty, tort (including negligence), product liability or otherwise. This includes but is not limited to the loss of data or loss of profit, litigation or due to business interruption, even if NUKEM Isotopes GmbH or an authorized representative was advised of the possibility of such damages. The limitations of liability set forth above are fundamental elements of the basis of the agreement between NUKEM Isotopes GmbH and all Site users. This Site would not be provided without such limitations. 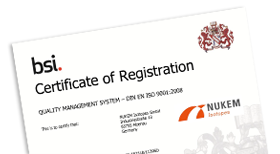 All information or data, its use and the log-in into NUKEM Isotopes GmbH websites as well as all actions, tolerations or non-actions associated with the NUKEM Isotopes GmbH websites are subject exclusively to German law. The exclusive place of jurisdiction shall be Aschaffenburg, Germany.